MultiPower Inverters come in power capacities ranging from 800VA to 10KVA. They are pure sine wave inverters designed to supply backup power to homes and offices. MultiPower Inverter Price in Nigeria ranges from 28,000 to up to 1.5 million Naira depending on the rated power output, whether or not battery and/or installation is included, your location, and bundled accessories. If you just need an inverter to power your laptop, TV, decoder, and/or DVD player or you just need an extended use UPS for your desktop PC or server, you can buy the 800VA MultiPower Inverter for just 28,000 Naira (without battery and installation). For more capacities in the home, go for the 1.4KVA or 3.5KVA inverters. Note that while the 800VA inverter requires one 12V battery, the 1.4KVA and 3.5KVA models requires at least two 12V batteries and four 12V batteries connected in series respectively. The MultiPower 10KVA Inverter requires at least 15 12V batteries. Each of our recommended 12V 200Ah SMF battery costs around 55,000 Naira. 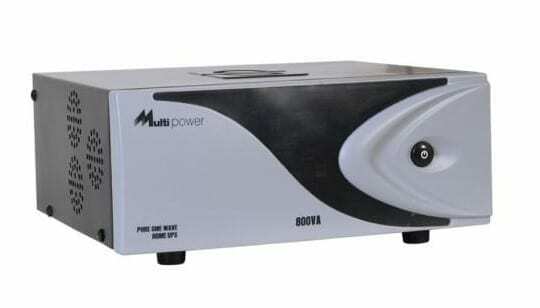 MultiPower Inverter is great for a home or office setting. They will supply backup power if public power supply goes out. Battery charges fast and kicks in once power fails. The Power Inverter may be sold separately or with the battery bundled. It may also include an installation kit. MultiPower Inverter deliver pure sine wave power output making them great for sensitive gadgets like computers, TVs and home electronics. They also come with built-in UPS ensuring an uninterrupted supply.